Bread is hardly a health food. For one, it contains gluten, which causes several immune-related disorders in susceptible people. And besides that, it's loaded with starches that convert to sugar. That can lead to insulin resistance, obesity, and diabetes in many people. So for my readers in these categories, bread is on the no-no list. But let's suppose you don't have any of these issues and you just want to know what kind of bread out there is the least offensive. Well, for you, there's definitely some good news. I've told you that whole-grain sourdough bread is a good option. I've also written about how eating berries with your bread can moderate the carbs' effects on your blood sugar and insulin levels. Now, researchers are saying there might be another option for you. But is there? Obviously, I'm never going to give you the green light to go eat some white sandwich bread. But research recently conducted at Lund University in Sweden has found something remarkable about eating bread made out of barley. Not only did it help the study participants avoid dramatic blood sugar spikes and diabetes risk, but it also helped improve their overall health. For this study, the researchers asked participants to eat bread made of barley kernels three times a day for three days. That's a lot of bread! The researchers evaluated the participants 11 to 14 hours after their last meal each day. They wanted to assess their diabetes and cardiovascular disease indicators. What they found was pretty incredible. 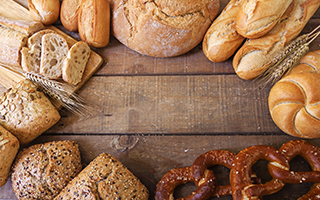 Not only did eating the bread stoke the participants' metabolisms for up to 14 hours, it actually decreased their blood sugar and insulin levels. Their insulin sensitivity, inflammation, and appetites went down as well. The researchers believe that these benefits occurred as the fiber in the barley kernels interacted with bacteria in the gut. This caused the body to release beneficial hormones. Those who had lower levels of the beneficial gut bacteria Prevotella copri experienced fewer of the positive effects. But the researchers believe that if these people continue eating barley, their bacteria levels will improve and they'll experience subsequent benefits. This type of bacteria not only helps regulate blood sugar, it also helps fight off unhealthy gut bacteria. So if your doctor has given you the OK to eat carbohydrates and you can find some 100% whole barley kernel bread, this is clearly a good choice.